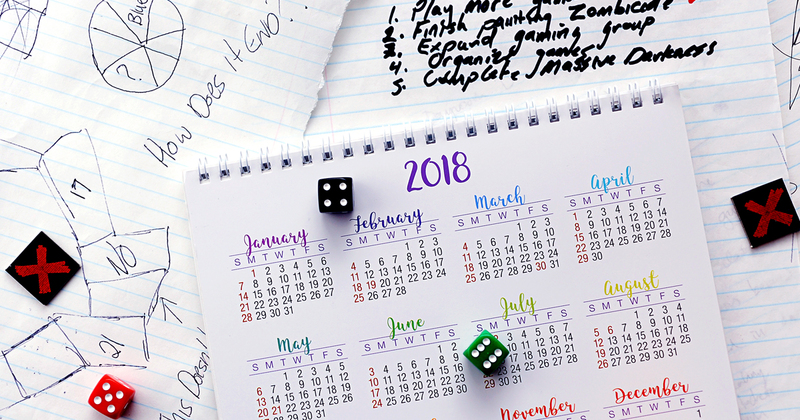 For a recent contest for CMON Expo 2018 passes, we asked people to name their gaming resolutions for 2018. As the ball drops in Times Square and the calendar flips to the new year, people tend to set goals for themselves to achieve in the coming months. For this week’s CMON Feature Friday, we take a look at some of the more common responses we got and provide some tips to stay on track. For experienced miniature painters, getting through the unpainted figures in their collection can simply come down to a matter of timing. If you’ve painted in the past, you know that it offers a cathartic and meditative escape from the pressures of the everyday world. It can be extraordinarily rewarding to take time out of your routine to focus on something that you enjoy. No matter what your hobby is, creating a time and space to do it is good for your mental well-being. For those new to the hobby of miniature painting, the roadblock may be something else entirely. When you see some of the amazingly painted miniatures out there, it can be intimidating to get started. You may look at the work of others and fear you’ll never get up to that level. There are a few things to consider: first, everyone has to start somewhere. No one was great on their first attempt, and they got better through practise. Second, there are a number of resources for people willing to learn. Soarstro is an excellent online instructor educating people on some of the simple techniques that will make your miniatures shine, but he’s not alone. There are a number of different instructional painting channels on YouTube, with knowledgeable teachers sharing their wisdom with the world. In short, don’t let time or lack of experience hold you back from a hobby that can yield tons of joy in the new year. We’ve talked a lot about the art of collecting games over the years. It can be easy to fall into the cult of the new, where you’re snatching up every game that hits the shelves. That can be hard to maintain for a lot of different reasons, not the least of which is that you’ll never get to play all of those games. As with any type of collection, it can be good to go through it and decide which items you want to keep and which would be better to sell or give away. Some people keep their collection of games on display in a prominent place in their homes. Others just keep their games in a closet. Either way, organizing your games can be informative and a lot of fun. Do you sort by title, or theme, or game type, or designer, or publisher, or even by color? The possibilities are endless. When you organize your games, you get a sense of the complete collection and can see what new titles you really need and what games you can stand to pass by. Our game collections say a lot about us, so taking the time to update and organize yours will be like an examination of yourself as a gamer. We all love tabletop games, but without the people to play them with, they wouldn’t be nearly as fun! Chances are that you already have a gaming group, or at least a few people to play with regularly, but we could always use more. The bigger the pool of people you can play with, the more potential opportunities you’ll have to play. There are many different ways to grow your community. Some include introducing new people to the hobby, while others mean getting out into the gaming world to make new connections. If you’re trying to bring people into the flock, look for people you already socialize with who may be predisposed to trying something new and nerdy. Coworkers, family members, or non-gaming friends may all make for good targets. Bring them in slowly with gateway titles that won’t scare them off. If you just want to get your gaming on, and not be burdened with shepherding in new players, there are lots of opportunities to explore in 2018. Check out your local Meetup groups for game nights as well as your friendly local gaming store (FLGS). Those are great places to start to find new folks to game with. However, nothing beats conventions for making friends. Going to a small local convention, or one of the big events of the year, provides lots of chances to sit down with people and game with them. You’re bound to find people you get along with, and even if you only ever see them a couple times a year at shows, the bond created when playing board games is really tough to beat! These were just a sampling of the New Year’s resolutions we got from people. We’d love to hear yours! Reach out to us on Facebook and Twitter using the hashtag #CMONFeatureFriday and let us know your gaming goals for 2018. Whatever you’re interested in, we hope your year gets off to a great start!